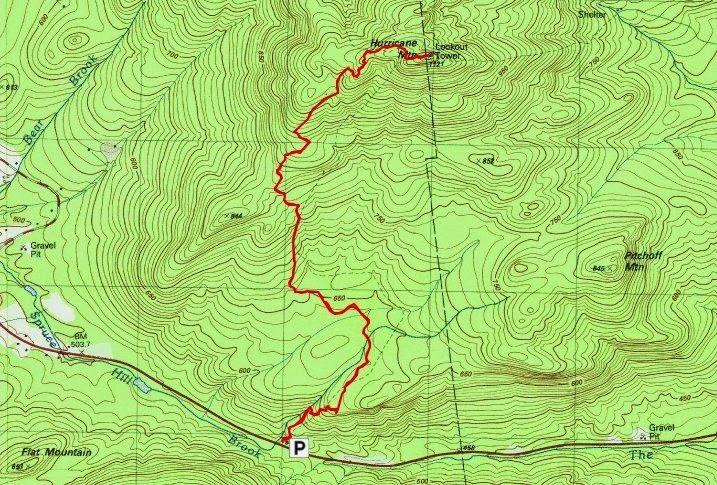 Wild, Windy & Wonderful described Hurricane Mountain in the Hurricane Mountain Primitive Area today. I got out of work at 4 PM and told some folks I was going to do a quick climb of Hurricane. They looked at me like I had two heads. For certain it was windy (30-40 mph), but the temperature was in the high 20's and the sun was coming out. I had the feeling I might see some interesting skies (and I was right)! 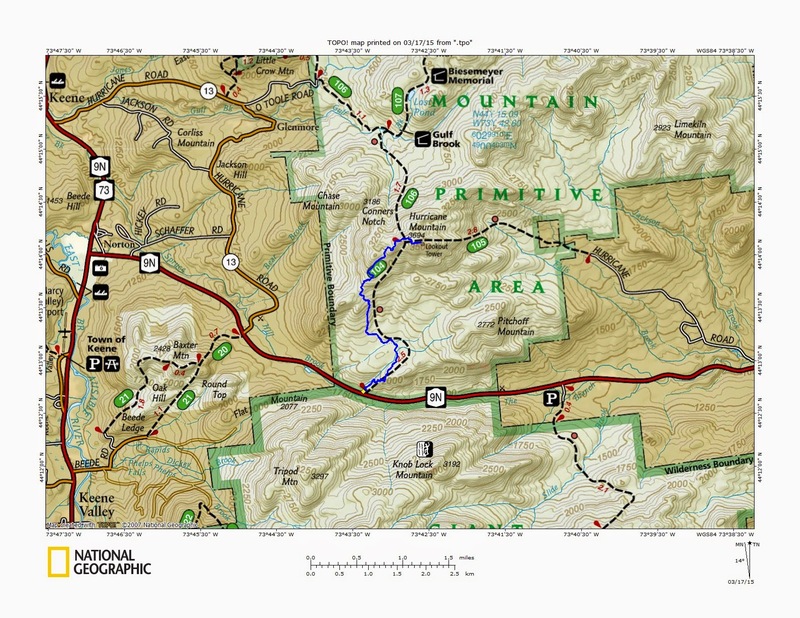 I changed clothes and was at the Route 9N trailhead and on the trail at 4:30 PM. I had until about 7 PM before it would start getting dark. I had multiple headlamps in my pack just in case. I had microspikes on my feet and carried my snowshoes in case the trail was soft. I never put the snowshoes on. The trail was hard pack with about a half an inch of snow on top; just perfect conditions. Look at the blue skies I saw on the way up! I was moving on the way up. I wanted to catch the good skies before anything changed. Along the way, I reminded myself how much I like this trail. It makes my top ten list for short trail of the 3 mile variety. Additionally, for those that don't know, the firetower on the summit will soon be restored! See the Friends of Hurricane Mountain website. I hope to help with that effort when it gets underway this spring. 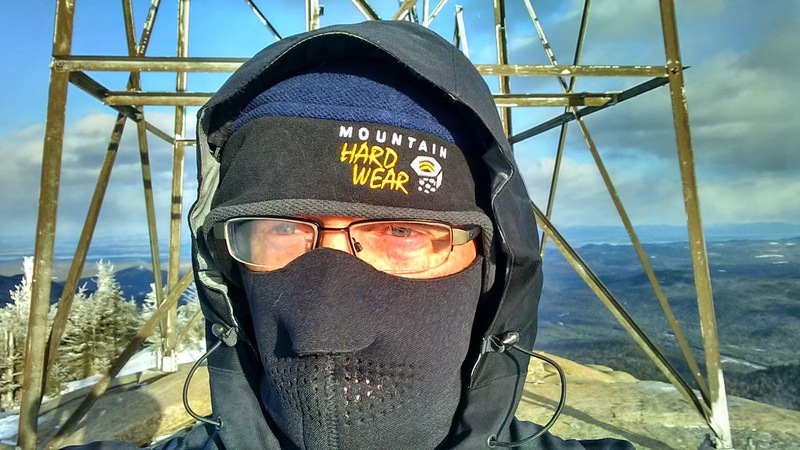 When I approached tree-line, I was getting hit with some strong gusts of wind so I put my facemask on (a rare event), and took my pack off so the wind wouldn't be hitting me and the pack. It had taken me an hour and 15 minutes to reach the summit. The sign at the kiosk says the trail is 2.6 miles long, but it is now 3.1 miles long after some trail re-routing that was done last year. The scene that was before my eyes was amazing. I took 150 pictures and forgot about the wind chill. I love the combination of blue skies and dark clouds; and then to add to it, the sun was starting set, making it that much more interesting. I pared my pictures down a bit for this blog post (as I always do), but I really got a bunch of great ones. I'll let them tell some of the story. I included more than I usually do here, but when I get a lot of good shots, I post a few extra. If you've never hiked Hurricane Mountain, do it! It will be crowded on summer weekends, but there are 3 different trails leading to the summit, and with good reason! I've got more pictures on a Picasa Web Album if you want to see more.